Stratego is two player competitive board game. The goal of Stratego is to capture the other player's flag or eliminate the other player's army. On the surface Stratego looks and plays somewhat familiar to other strategic board games such as chess, but some mechanics makes Stratego stand out. Stratego has existed for a long time, the version that is played today can be tracked to have existed before the first world war, and the rules of that game can be traced to classical Chinese games. We played the classic version of Stratego that is played with 40 army units and on a 10x10 square board. There are however other variants of Stratego. Some are set in a science fiction universe and others are themed around pop culture brands such as The Lord of the Rings or Star Wars. Stratego starts with both players deploying their armies on their side of the board. A screen is placed in the middle of the board in order to hide where the other player is placing his or her units. Each unit has a front side and a backside. On the front you are able to see what unit it is and which rank it has. The backside looks the same as every other unit. The armies are placed so that the backside of the units are facing the other player. When both players have deployed their armies the screen is removed. Because the players can only see the backside of the opposing army they are unable to tell which unit is which. The players then alternate playing their turns. Each turn the player moves one of his or her units and then passes the turn to the other player. The players can remove units of the opposing player by defeating them in combat. Combat is triggered when one player moves one of their units into a square occupied by a unit owned by the other player. Both players then reveal what unit that is battling, and combat is then resolved based on the ranks of the units involved. Both players keep playing until one of two things happen. The first is if one player manages to capture the other player's flag. The other way is if one player eliminates all of the other player's units that are able to move. Stratego has two main objects, the map and the army pieces. The map, as stated earlier, is a 10x10 square grid. The map has no special properties except limiting where the player is able to move his army pieces. The player is limited to move within the 10x10 board. The player is also limited by the two lakes that are placed in between the two armies. The lakes split the map so that both armies has to approach from one of three “bridges” that are 2 squares wide. The army pieces are what the players move and control in order to play the game. Every army piece , except two, have a number assigned to them between one and ten. This number determines what rank the army piece has, and in turn, what special properties that army piece has. The army pieces that don't have a number assigned to them are the flag and the bombs. Both have special properties that makes them different to the other army pieces, which is why I will go over them later. The higher the rank of a army piece, the fewer the number of them are in each army. For example, rank 10 units are called field marshals and there are only one in each army. Scouts are rank 2 and there are 8 of them in each army. Every army piece, except the bomb and the flag, is able to move one square every turn. Combat is triggered when one piece moves into a square that is occupied by an enemy army piece. The combat winner is determined by which army piece has the higher rank, that piece is the winner and removes the other piece from the game. If both army pieces have the same rank, both are removed. There are some exceptions to this rule, but they are tied to the special properties of some pieces which I will cover now. Bombs and flags are unable to move and can therefore not attack enemy pieces. They can however be attacked. If your flag is attacked, then that means that the enemy has captured your flag and therefore won. The flag doesn't have a rank, which means that any unit that attacks it will be victorious. The bomb however, explodes when attacked and removes the attacking piece from the game, no matter what rank the attacking piece had. The bomb itself doesn't get removed if this happens, and can blow up another unit if it steps on the bomb again. There are also some army pieces with special properties. The army piece that is assigned the rank of 10 is the field marshal. The field marshal doesn't have any special properties of his own but because he has the highest rank on the battlefield he is able to defeat any unit he faces. The only way for him to get removed is he attacks a bomb or the other player's field marshal, except there is one more unit that can remove the field marshal. The spy has the rank of 1. The spy would be defeated by any other unit in the game if he were to battle with it. However, the spies special property is that if they attack the enemy field marshal, the field marshal is the one that gets removed from the game, despite having the higher ranking. The scout has the rank of 2 and is able to move a bit different from the rest of the units. As long as the path ahead of the scout is clear, the player can make the scout move as many squares as he or she likes. If a army piece is assigned rank 3 it is a miner. Miners have the special property of being able to remove bombs. If a miner attacks a bomb the miner is able to remove the bomb without it blowing up. Units of any rank not specified here doesn't have any special properties except their rank which decides what units they can defeat in combat. I've already covered the important relationships between the different objects when talking about their special properties, but I will make a short recap. Combat is determined by which unit has the higher rank, except for some special cases. The unit with the lower rank is defeated and removed from the game. The flag is always defeated and captured when attacked which causes the game to end. Bombs defeat every unit that attacks them except for miners which are able to remove them. Spies are defeated by every other unit but can remove the other player's field marshal if the spy is the one attacking. One relationship that hasn't been mentioned is that you can not move a unit into a square occupied by another of your units. To me the most interesting mechanic is that you are hiding what units you have from your opponent. The reason why I think that is because I think that is what separates Stratego from games such as chess, which at first glance looks similar to Stratego. In chess you know where your opponents pieces are and can plan accordingly. In Stratego you can never be to sure what your opponent is hiding. If you are pushing into your opponents side of the board you are fearful of bombs that might be scattered around there. Attacking with your field marshal should allow you to win most fights, but what if the enemy spy is lurking around and is able to take down your field marshal. It makes you question every move and adds a lot of tension to a otherwise very simple game. Not knowing what the opponent is doing also opens up a lot of potential mind games between the players that also keeps the game interesting. Bluffing is an effective and common tactic when playing. If you have revealed your field marshal by attacking with it and the opponent starts to move a unit towards it, you immediately fear that it is a spy heading to kill your field marshal. It might however only be a scout that is acting as a spy in order to scare away your field marshal, whilst the real spy is safe. Another example of a effective mind game is to not move a certain unit for the whole game. This gives the impression of it being a bomb and makes your opponent avoid that unit until he or she decides that it is worth attacking, either with a miner or with another unit he or she is willing to lose. Stratego's box says that the game is aimed at children eight years or older, which I can agree with. The rules of Stratego are easy to learn and understand, which makes it easy for a child to learn them. Stratego looks colorful and it is clear what everything is supposed to represent, which helps it appeal even more to that particular age group. An eight year old might not think the game is fun for the same reason I think that it is fun however. I enjoy Stratego because it provides easy access to highly strategic game play. Without having to spend a lot of time learning the rules, or worry about complex mechanics, I am able to play a highly strategic game that relies on me bluffing and/or outsmarting my opponent. Someone that is eight years old might not enjoy Stratego because of its strategic depth, but rather because it allows you to battle two armies against each other. That doesn't mean that I think they wont play without a strategy in mind, but rather that they are more interested in having two armies battling than trying to outsmart their opponent. Because of its simple to understand rules Stratego is easy to pick up and play with anyone, even someone without much game experience. If you feel like throwing an army against a friend it allows you to do just that. Stratego also allows you to face of against someone in a battle of wits and strategy. Carcassonne is a well known board game released in the year 2000. Set in the medieval age, the players try to occupy as much of the land as possible. Roads, farms, cities and cloisters are all fought over in an attempt to come out with the most points in the end. The main objects in Carcassonne are the terrain tiles, which are used to build the board, and the followers, which are used to gain points. Each player starts with a set amount of followers while the terrain tiles are placed face down in a common pile. Terrain tiles have one or more kinds of terrain on them which changes how the tile interacts with other objects, both followers and other tiles. The four types of terrain in the main game are cities, roads, fields and cloisters. We also played with the river expansion. The difference from the main game is that instead of starting from a predetermined tile, the players instead start by placing a river on the board, other than that nothing differs from the main game. Your followers change depending on which of these terrains they are placed. If your follower is placed in a city it becomes a knight, if it is placed on a road it becomes a thief, if placed on a field it becomes a farmer and if it is placed in a cloister it becomes a monk. In Carcassonne everything is related to the tiles. When you place a tile it has to be connected to another tile. It also has to fit into that tile. I can't for example place a field so that it is attached to a city. I have to place a field so that it connects to another field. This is true for all types of terrain. Carcassonne is designed in way that it almost always is somewhere where are allowed to place a tile. The only exceptions to this that I can think of is if there are no incomplete cities, but that is very rare and there is only one card in the game that would cause it. Tiles also relate to the followers because depending on where they are placed they become different followers, which in turn affects how they relate with the terrain they are placed on. A knight for example has no relationship with a thief. The relationship between the tiles and the followers is also what determines the points you get. If you have a knight in a city and the city gets completed you get points depending how big the city is. Thieves and roads, as well as monks and cloisters follow the same relationship. When the road or cloister is completed the player with a thief or monk in it gets points. Farmers are a bit different because they get points depending on how many completed cities are touching the field they occupy at the end of the game. Followers and tiles are heavily related, but followers don't have much to do with each other as mentioned. No matter how a farmer is placed, it cannot affect what a thief can do or how many points it gets. Two followers of the same type however do have a relationship with each other. You can't place a knight in a city that already has a knight in it, or place a farmer in a field in which there already is a farmer. The only way to have multiple knights or farmers in the same city/field is by merging two or more separate cities/fields. If that happens the player with the most of the relevant follower get all the points. If all players involved control the same number of followers in the city/field, the points are split evenly between them. The only follower that doesn't have any sort of relationship with another follower is the monk. Monks score points by counting the number of tiles adjacent to the cloister it resides in, including the tile the cloister sits on. Because the cloister only sits on one tile, and because you can only place followers on a tile you just placed, there is no way a monk can influence another monk. The closest two monks can get each other is by sitting in two separate cloisters adjacent to each other, but the monks still have no effect on each other. What really makes Carcassonne, Carcassonne to me is the way you draw tiles to construct the map. As stated earlier the tiles is what influences everything in Carcassonne. If you were to give Carcassonne a static map, everything that makes Carcassonne interesting disappears. Because the player are drawing random cards there is no certainty that the player will be able to complete to the city they have been building the whole game. This, combined with the finite followers the player is given, makes it an investment to place down a follower. Farmers have the potential to give the player a big amount of points if there are many complete cities around the farmer. This makes it tempting to place a farmer in a field as soon as possible, but since the player can't control what cards he or she will be given there is no certainty that there will be cities around that farmer at the end of the game. If that happens the player have effectively played with one less follower than the other players have. On the other side of the coin however, the other players may have built a bunch of cities in that field that turns into the farmer into a worthwhile investment. I think that this kind of risk and reward style is what makes Carcassonne interesting to play, especially if you want to play it multiple times, and what makes it happen is that the players draw random terrain tiles. Although I keep talking about unpredictable Carcassonne is, there is still an element of strategy and planning involved. If the player draws a cloister and knows that another player is trying to expand a city of his, the player can place the cloister in the vicinity of the city and as the other player expands the city, the player accumulates points from his cloister next to it. There is also an element of sabotage involved. If you are able to finish another player's road, you deny them from expanding it and denying the other player points that way. Placing odd city tiles next to an incomplete city can make hard or even impossible to finish it. What all this results in is a game in which you can never be certain that you are going to win. Although you can gain a advantage by planning ahead, you are never the surefire winner of every game of Carcassonne you play. This makes it so that novices have a shot of keeping up with more experienced players, making suitable to play with less experienced friends if you are just looking to have fun. However, sometimes players go into a game of Carcassonne with different expectations which can make the game less enjoyable for some. The biggest example is if one player thinks through every move he makes, while the rest of the players just want to play for fun. This makes the game slow for most players, and the thinking player might be annoyed that he is the only one playing the game seriously. Carcassonne is marketed at people eight years or older. That they are aiming at a younger audience can be seen in both how the game looks and how it is played. Both the box art and the tiles are used to depict a colorful variant of the medieval age. The medieval age is often portrayed as violent and bloody, but this depiction focuses on building the land that the medieval age was set in. There are no wars or battles in this game that could make parents find it unsuitable for kids. Combining this with the easy to understand rules and the random elements involved makes it a game that is easy for kids to learn and play, that also interests them with its setting. The random elements makes it so that everyone has a shot at doing well while playing, even if they're not thinking hard on the decisions they make. The very same reasons described above is also why Carcassonne is sometimes described as a “gateway drug” into board games for people that have never played them. Because most persons are able to grasp the rules of Carcassonne by playing one or two rounds of it it is perfect for people trying to get their friends into playing board games. By playing Carcassonne for an hour or two, inexperienced board game players can experience playing and understanding a board game and in turn decide if it is something that they enjoy or not. Carcassonne is a game built around a random draw mechanic mangages to not get overly frustrating as some games relying on random draw mechanics can get. Its lighthearted style as well as its easy to understand rules makes it easy to pick up and play for anyone. Although it isn't very complex Carcassonne still manages to make experienced players interested by challenging them to make smart investments and manage the risks of their decisions. Last week I talked about the picture I made that shows how much you've upgraded your character's outfit. I only talked about the first one last week so it seems fitting to talk about the other two levels this week. These pictures are supposed to show progression as you upgrade your character. The reason why we decided on adding these pictures is because it is hard to tell exactly what happens to your character's sprite because it is so small when you look at it when you are playing. Considering this, the number one thing I had to keep in the back of my mind when making the higher level pictures was "upgrade". If you couldn't tell from the pictures I made that you had upgraded the whole point of the pictures was lost. The level two upgrade was fairly straightforward. 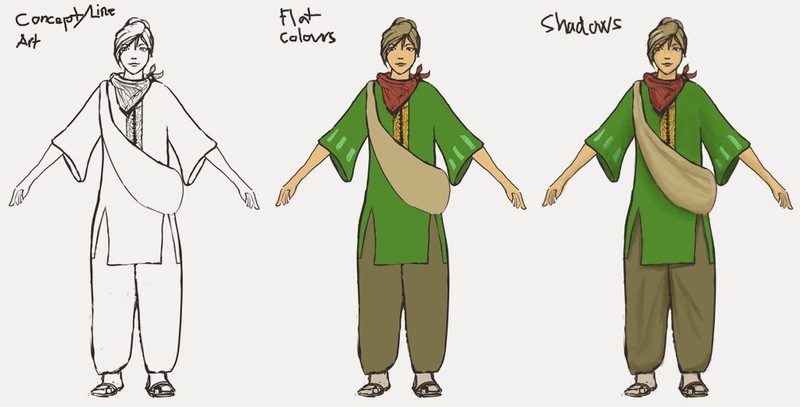 When I first started making concepts for the different outfits I quickly decided on having a scarf or something similar to show progression as it would be quite visible even from a top down perspective. With that in mind it was just a simple process of opening the level one photoshop file and start adding onto it. It was very easy because I had a clear vision of what I wanted to do and also because I had the level one photoshop with all layers separated to work with. The level two picture was made without causing me much trouble, the same can't be said about the level three picture. Like the previous picture, I had a good grip on what I wanted to do when I started out working on the third one. At level three the sprite in the game gets a big glove as well as some arm accessories. While it works when you look at the sprite, adding these details to the picture turned out very unremarkable. The change wasn't as noticeable as the one from level one to level two. This is were things got though. Unlike the prep work I had for the level two sprite I didn't have any concept pictures that fit perfectly. There was some ideas from the concept stage that I considered, but nothing that really stood out as a perfect solution. In the end I ended up just drawing things and seeing what stuck. What I ended up with was a more intricate robe and a new bag. They aren't groundbreaking additions, but they help add to the feeling of progression. I haven't asked for any feedback on it yet though so we'll see if it stays as it is or if I'll have to change it. That is all from me this week. Hope you enjoyed reading this and hopefully you'll be back next week. At last I am free from making sprites. For now at least. Last week I made every version of the main character sprite, nine in total. If you are not sure what I mean it is as follows: In our game we have a main character. You can upgrade her clothes and weapon independently, with three levels each. This means that I had to create sprites of the main character with a first level suit and weapons one, two and three. Then do the same for both the level two suit and the level three suit. I've attached a image below showing how the main character's sprite changes if you only upgrade her weapon and not her suit. Weapon progression from level one to level 3. However I feel like I've talked enough about how I make these sprites and that it is time for me to talk about something else, so that is what I'm going to do. To upgrade the character you enter a menu and select what aspect of your character you want to upgrade. To show which aspect you can upgrade and what it will change we have pictures in this menu. These pictures are not pixel art like the rest of the game. Instead they are straight up painted images me and my team members have made. We choose to it this way because none of our artists are really comfortable making large scale pixel art. It also meant that we could use any concept we made and turn it into an in game artifact. Seeing as I had made all the things related to the main character up to this point I felt it was fitting for me to take on the responsibility to create these upgrade images. I had already made the concept art for her level one suit which meant that most of the work was already complete and all that was left was to colour it. When I first started planning this I had it in my mind that it would be fully rendered with material and lighting. My producer however was shocked by how long I estimated it to take and said that it wasn't acceptable, so I proposed to only add some flat colours and and some shadows to that which wouldn't take nearly as long. This my producer thought was more reasonable. The steps I took to get to the final product. I think the colours are a bit off though. In the end I'm quite happy with the result even though I only put in a couple of hours into it. There is definitely improvements to be made if I wanted to but time is becoming sparse, and I will probably not be able to implement them because there are more important things that needs to be made/improved. 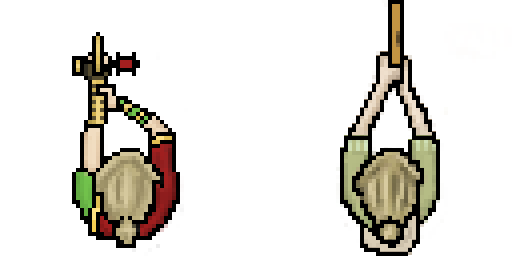 If you've been following this blog, you will know a fair bit about the sprites I've been making. Last week I talked about the level two sprite. The logical progression is that today I will be talking about the level three sprite, which I will. The level three sprite was a mixed bag of obstacles. The weapon she would be using had no clear concept at all, the only thing that was set in stone was that it was supposed to be attached to the main character's arm. There was also the recurring problem of not having enough room on a 64x64 pixel big sprite to show any significant progression. What worked in my favor was that since the gun is attached to the character's arm I could use the level one sprite as a base on which the level three sprite was made. I only had to move around her arms a bit to create the pose and from there on out it was smooth sailing. You can see the similarities below. Making the gun was interesting because, as I said, I had no direction to start in. This meant that I had to experiment quite a bit. Unfortunately I have nothing to show from those experiments but there are still some remnants in the final version. The spool of thread on side was one of the first things I added. Maybe it has some interaction with the weapon or maybe she uses it while she works, since she is a tailor. The spool felt a bit too heavy on it's own, so I added a counterweight to the other side. The pipe was originally bigger, but it felt to cumbersome to be carrying around on ones wrist, so I made it smaller. 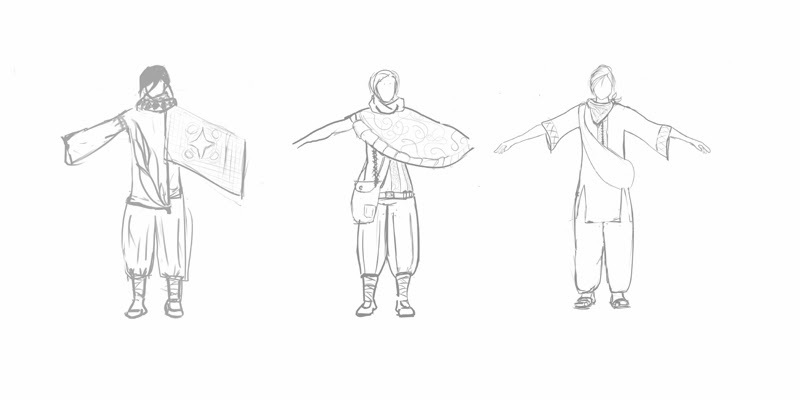 If you look at the image I've provided you can see what I've done to show the progression of the character. The scarf/blanket on her is added at level two, which I unfortunately don't have a picture of at hand. In my previous post there is a picture of the level two sprite, but it is not the most updated version. Anyways, what is added at level three is most notably a leather glove with brass clasps that covers her whole lower arm. She also has a piece of cloth attached with brass bracelets on her right arm. It is still fairly hard to tell what they are supposed to resemble, but in the game we will have some high resolution pictures which hopefully will make the player understand what everything is supposed to be. 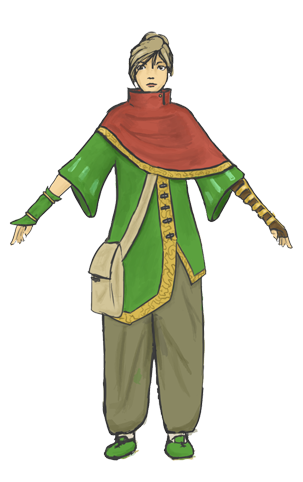 Keeping with the theme I've set these past two weeks I'm going to keep talking about the different artifacts I've created related to the main character in the game me and my group is making. Last week I talked about how I made the first sprite of the main character, the level one sprite which you start out as. This week I'll talk about the level two sprite, how I made it and what challenges I faced while working on it. After I made the level one sprite I immediately moved on to making the level two sprite. At level two the character has some more stuff on her and is carrying a gun instead of a pistol. Having a gun instead of a pistol meant that I couldn't recycle the level one sprite to create the level two sprite. There was also a problem making the main character look stronger because the character is both top down as well as only 64x64 pixels big. The limited size of the character means that anything I add has to be fairly big, because you wouldn't be able to tell what it is supposed to be otherwise. Furthermore the only area that I'm able to add detail on is the on top of the arms, shoulders and head. The steps I took when creating the level 2 sprite were the same as the ones I described last week when I made the level one sprite. I start out by sketching the pose and making it look anatomically correct. After that I add some flat colors, boxing in the shapes of the character. I then add a black outline around it and add some texture to the colors. The level two picture in this post is not completely accurate as I've made some corrections to it, mainly changing the shroud on her shoulders from blue to an almost scarlet color with a golden border. The green has also been made a bit more saturated to stand out better from the background. You can see that green color in the second picture. 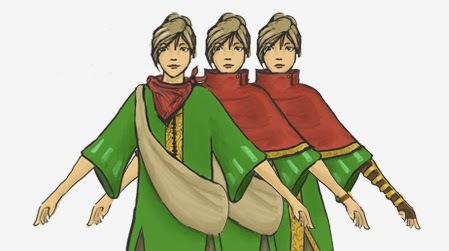 The second picture might be a bit confusing if you read last weeks post as it looks more like the level one sprite than a level two, or even a level three sprite. The reason is because it is a level one character, but with an upgraded gun. It is the same base as the level two sprite but I've removed the shroud and added the bag from my level one sprite. In the end I not really pleased with how the level two sprite came out. Especially the arms I think could use some work, but at this point it is probably more important to make sure all the art assets exists instead of polishing a single artifact to perfection. These lasts weeks I've mainly been working on the main character. Last week I discussed how I designed the main character and showed the different stages she went through during the design process. This week I'm going to talk about how I turned the concept art into the sprite that is in the game at the moment. The sprite I'm mainly going to talk about is the level one sprite that you see when you start the game. I'm almost complete with both the level two and three sprites right now, but I think the process of making the level 1 sprite is more interesting as I had no experience making sprites when I started out. The level one has her holding a a pistol with both her hands. The game is top down so the only things you see is the top of her head, her shoulders and her arms. Starting out I made a new 64x64 canvas in photoshop which I then sketched the the main character's pose on to. I used a small brush tool with a lower opacity for this as I didn't need to define the lines at this stage. In hindsight I should've probably started out with a bigger canvas and then scaled it down to 64x64 when I was happy with the proportions. When you are working in such a small size as 64x64 it is hard to make lines the way you want them to, which is why I think that starting out bigger would've been easier. When I finished her pose I made a quick outline and started to put down color on her just to experiment with her color scheme. I may have done this a bit backwards as I put down the colors before I had a final outline to work with. Instead I put down the colors on top of the half-assed outline and then created the final outline by painting a darker color around the main color. E.g. to outline her green clothes, I took a darker shade of green and created a one pixel wide outline around it. At this point I was using a one pixel big pen tool in photoshop. This technique of making an outline looked good in photoshop, but when it was put into the game it didn't provide enough contrast to stand out. To fix this I made the outline pitch black which made everything much clearer in game. It's still not absolutely final as some group members still have some problems with the colors, but at this point I'm starting to feel I've put more than enough time on it and that my time could be better used on something that is yet to be created. That is something that I will have to speak with the rest of group about though. At the moment we are creating games based on the concepts we did a couple of months ago. My group is creating a "defend the objective" type game where the player is tasked with defending his/her truck from waves of bandits. The most off the cuff mechanic in this game is that you are only allowed to move in a circular arc around your truck. To make sure we are going to complete the game before the course is finished we are working by using scrum, a framework designed to constantly update and iterate what you are producing. In scrum you work in sprints. Each sprint is a set amount of time in which you set out to complete goals you made at the start of the sprint. I took on the role as lead artist again and these first couple of sprints I've mainly focused on creating the main playable character. I had a lot of freedom when designing her as we hadn't come up with any specific details that she had to have. The only directions I got was "anything is fine as long as it isn't revealing". Although there were still some contextual guidelines. Her clothes, for example, should be easy to move in and not that delicate since she is a traveler, they should however be a fairly good condition as she is a tailor. 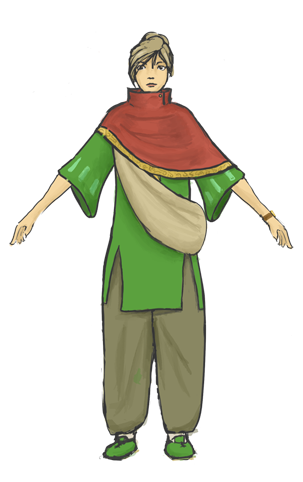 Another challenge designing her is that in the game you are supposed to have three different levels, represented by different clothes. This means that I have to design three different outfits for her which makes things a little more complicated. Above I've attached a couple of different concepts I sketched. To make the process of designing them faster I made a base human which I then used as a mannequin that I was able to just draw different clothes on. The one furthest to the left is the first one I did. It is a bit of a mess because I just drew whatever came to mind, but it has a lot of elements which carried over to the rest of the designs. The one in the middle is probably the sixth or something I made. I'm quite pleased with it as it shows a lot of intricacy, with different patterns and details. However it is a bit to much for a level one outfit, and as that was the one that the most important at the moment I didn't end up going with it. The last one is the final concept of her level one outfit. It isn't flashy, which is what I want, and I think it fits someone who travels about. There are still some problems that needs to sorted out however. The biggest is that because the game is top down you aren't going to able to see any details that are not on the head or on top of the shoulders and arms, but I'll be able to overcome it.